Golfers will find challenges at every turn on our companion signature Arthur Hills Legends Course. The par 72 layout is a classic at 6,984 yards. Hills used a superb natural setting to create a masterpiece in playability and variety. It features natural wetlands, narrow pine corridors, small greens and strategically placed water hazards. The Legends Course calls for a player to use their mind ahead of their muscles. 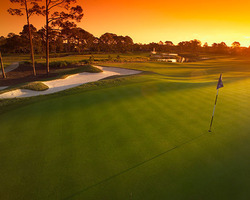 Good strategic planning will reward the player with good results and an enjoyable round. Each hole is unique and memorable. 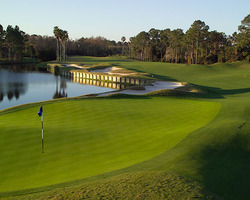 The Legends Course played from the proper tees poses an appropriate challenge to more accomplished players and fairness to high handicappers, seniors, women and junior golfers. This signature Rees Jones golf course is a favorite of the tour players. It is a traditional links style 7,088 yard design. You'll enjoy the strategic mounding, numerous expanses of sand bunkers, natural marsh areas, beautiful lakes and undulating greens. While extremely playable for all skill levels, the ingenious and inventive player is rewarded with multiple options on nearly every shot. Each course at Plantation Bay Golf Club compliment each other while offering different approaches to the game. Club de Bonmont Course at Plantation Bay Golf Club has been ranked as one of the "Top 50 Florida Golf Courses" and "50 Most Distictive Courses in the Southeast U.S." Designed by Steve Smyers, this course has sweeping elevation changes with beautiful vistas winding around natural and man-made hazards, undulating greens, bunkers, trees and water. Extensive landscaping throughout this picturesque course provides a park-like setting. This Championship course stretches to 7,200 yards for the back tees and with risk-reward drivable par-4 options to par-5 holes that will test golfers to "go for it", Club de Bonmont Course will require players to nearly use all clubs in your bag! Each Plantation Bay Golf Club course has its very own personality even though within the same Club complex. 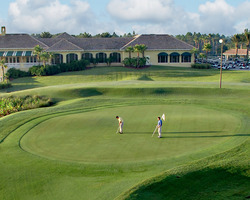 Meandering through over 150 acres of pristine East-Central Florida forest, Prestwick Golf Course at Plantation Bay Golf Club offers golfers a championship test with immaculate playing conditions just like companion course Club de Bonmont Course. Prestwick was built in 1998 by renowned Architect Lloyd Clifton and is the shortest of the two courses playing to a total length of 6,465 yards from back tees. Characterized by rolling fairways, routed around natural and man-made water hazards and pristine waste areas, Prestwick is a shotmakers dream with a premium on solid shot-making that challenges golfers of all skill levels.